Preheat oven to 180°C/350°F. Separate egg yolks from egg whites. In a stand mixer bowl, beat together sugar and egg whites, for approx. 3 – 5 min., until stiff peaks form. Beat together butter, egg yolks, and confectioner’s sugar for approx. 3 – 5 min. Sift in flour and mix well to combine. In a large bowl, fold egg white mixture into butter mixture. Next, evenly divide batter into two halves, add cocoa powder to one bowl, and mix well to combine. 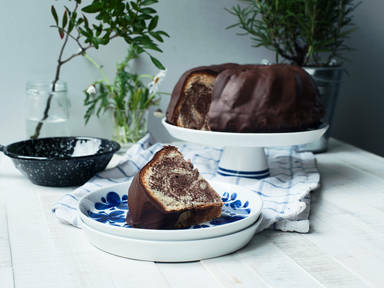 Grease and flour bundt pan. Spoon light and dark doughs into pan in alternating layers. Bake in preheated oven at 180°C/350°F for approx. 50 – 60 min. Remove from oven and let cool in the pan for approx. 15 – 20 min. Then turn out onto a cooling rack. Once the cake has cooled melt butter and chocolate glaze in a small saucepan over lowest heat for approx. 8 – 10 min. Stir until everything has melted. Spoon chocolate glaze evenly over the top and leave to set. Enjoy!